“Calling all baking pranksters!” Do you love to have innocent and harmless fun? I sure do! Humor is good for the soul and keeps you young. Treat those around you to plenty every chance you get! 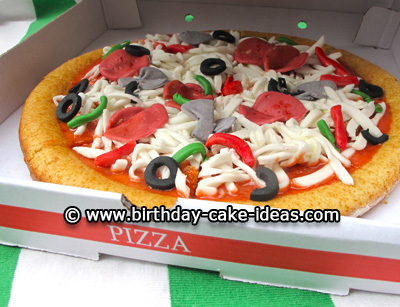 If you are the usual cake baker in your circle, one of the funniest pranks to pull on an unseeingly birthday pal is to create the ultimate “Gag Birthday Cake”. Very easy to do and still showing off your creative genius, create a beautiful pretend cake for everyone to enjoy (well, mostly everyone)! You will want to trade in your cake mixes for some boxes or Styrofoam. This will now become your “cake”. Start by carving your “cake” into the desired shape. 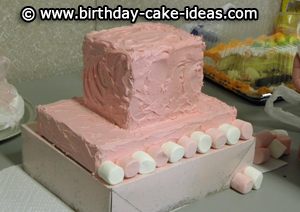 In my opinion, if using boxes a square multi tiered cake is works best. 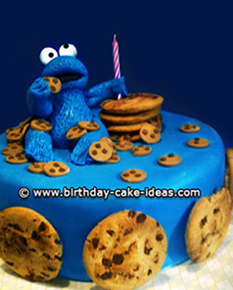 This will be the design of your cake. One of the last gag birthday cakes I made, I used three tiers of square boxes. 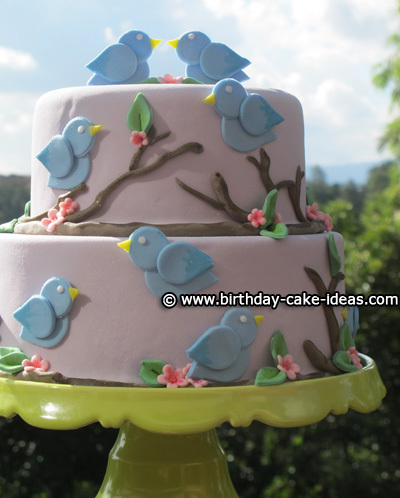 The bottom tier was spray painted pink to match the overall color of the cake. Once dry, we began to stack the cake. The top two tiers were iced with actual strawberry flavored pink icing (smelled delightful)! 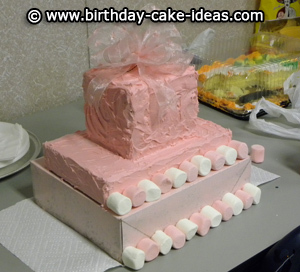 For added decoration, I used pink and white marshmallows around the base of each tier. This just helped to hide any imperfections in the boxes. For a topper, we made a pretty and simple pink bow to drape over the top tier of the cake. The “cake” was beautiful. Both looked and smelled like a cake fresh out of the oven. The comments were just as yummy, “That cake is just too pretty to cut”, etc. Cake cutting time fell upon us and almost made me sad, ALMOST! She couldn’t believe all that was for her. Her eyes teared up and she was just so happy we did this for her! We jumped right into the birthday song and it was time to dig in! “Wait, the knife won’t cut it”. She tried a few times and even a different knife before she realized she was never meant to get a piece of that pretty cake! HA, mission accomplished! This was one of my best “gag birthday cakes” thus far. A few words of wisdom: be sure to have some sort of birthday cake or cupcakes for your guests to enjoy after the prank is over. After all, they worked hard for it!